workshop descriptions, Best Practices committee updates, speaker biographies and much more! 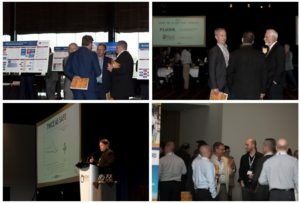 The afternoon of Day One began as usual with a Safety and Productivity Moment that was brought by Tammy Hawkins from the Alberta Construction Safety Association, continuing with a report from the COAA Board and a discussion on the organization’s strategic direction and mention of long-standing partners. 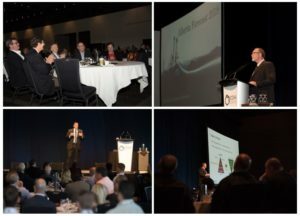 Following this, Herb Holmes of the Construction Labour Relations – Alberta, presented his 22nd fearless workforce forecast – a main event draw-in every year. After dinner, and of course more networking, it was time for the well-deserved award presentations. The Don Currie Award, recognizing individuals whose dedicated service has contributed to the success of COAA, was awarded to its first woman to date, Dr. Aminah Robinson Fayek, professional engineer and professor in the Hole School of Construction Engineering at the University of Alberta, where she has held three consecutive terms as NSERC Industrial Research Chair in Strategic Construction Modeling and Delivery. The evening concluded with a keynote presentation from Peter Dumont, President of the Construction Users Roundtable (CURT) who shared his knowledge and expertise on the OS 2.0 vision. The second day of the conference began bright and early with another great Safety moment and leading right into the first plenary session of the day, presented by the Construction Industry Institute’s Director, Dr. Stephen Mulva on the overall topic of OS 2.0 and pragmatic things that need to change. Up next in the day, was the anticipated A&D Panel with discussion on challenges and opportunities. The panel of medical experts, as well as the audience, were keenly engaged as the conversation was flowing. You can find a brief bio about each panelist in the Conference Program. 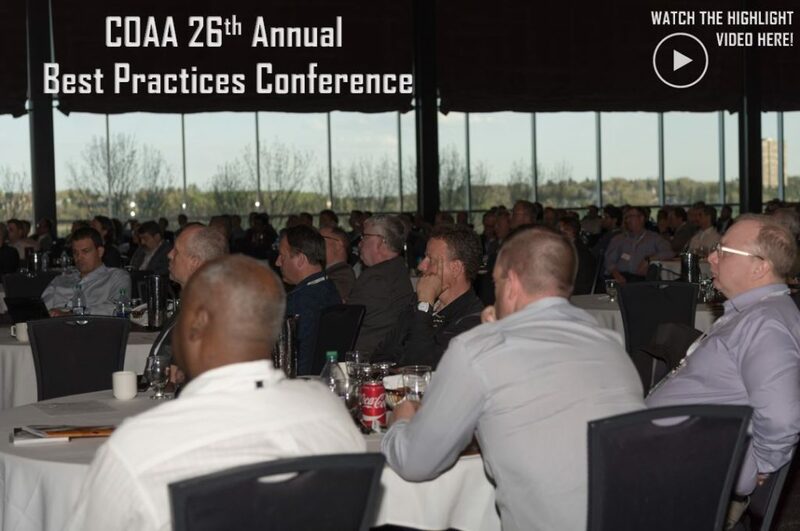 The afternoon was occupied by a variety of workshops ranging from Recognizing Signs & Symptoms of Drug Use in the Workplace to Scalable AWP to Collaborative Contracting – Strategy, Process and Tools. All were well attended, and the feedback received was invaluable. Scroll down to see a list of workshop presentation documents. What best practices or ideas can you implement to make your project or your company even safer and more productive? Twice as Safe, Twice as Productive is not going to happen by itself – each of us has to take the lead to drive towards that goal. The board and staff at COAA extend their sincere appreciation to everyone who attended, participated and sponsored the conference. Our continued success would not be possible without you.